At a time when our shopping High Street is changing drastically, with more and more landmark stores going into administration, what great news to hear that there is now an opportunity for you to order pierate merchandise from the comfort of your own sofa! The pierate range includes (but is not limited to) pierate postcards, greetings cards, mugs, t-shirts and keyrings. I think you’ll agree, the black and white logo is striking and visual, but also practically helps you remember the website name and those all important seven Cs, which every pierateer (official or unofficial) needs to remember when reviewing their pie! While we’re not expecting orders to flood in, the Pierate Shop has now set sail and is taking orders for any pierate fans out there. Just let us know what you would like the logo on and we’ll do our best to meet your order and get the merchandise to you as quickly as possible, based on our supplier’s charges and delivery options. We may not be able to provide everything but we very much hope that you will enjoy sailing with us! Orders should be directed to pierateship@yahoo.co.uk for discussion and pricing. 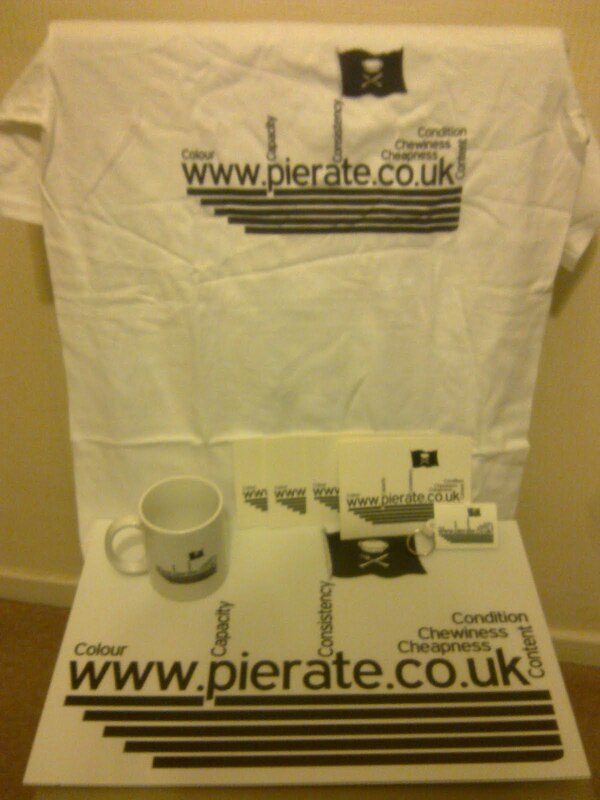 And as a celebration of the Pierate Shop being founded, we’re giving away free postcards and a free t-shirt at #Piefest2013 on 19th January 2013! Look out for a post about that shortly!